SkyCiv's Structural Analysis API (Application Program Interface) allows users to connect directly to the SkyCiv Solver. Basically, users can now send input directly to our servers from any application and receive the results from a full Structural Analysis Solver! An API makes it easier to develop a program or tool, by giving our users the building blocks they need. We believe there are many people out there that will benefit from building their own custom programs to solve the issues they are facing in day-to-day structural analysis, and we want to give you the tools to do so! Leverage our solver to build your own web apps, tools or even integrate with your existing software! You can make a direct call to our server from your web application or desktop program (such as Microsoft Excel) using just about any coding language! The API allows you to make a number of small applications that will help you with your specific needs. 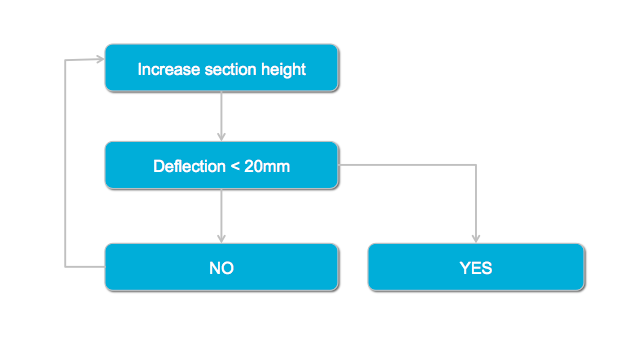 For instance, say you need to design a beam member that can deflect no more than 5mm. You can write a simple program that will iterate through our API - continually changing the section height and checking deflection. You will need to sign up for free to get access to the full API. You can also visit our documentation to get started and learn how to use the API. This features examples and explanations about all the different input and output.